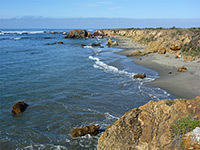 Northwest of the small town of Cayucos, the sandy Pacific coastline which extends 12 miles south past Morro Bay is replaced by low cliffs formed of layered, reddish-brown metamorphic rocks, eroded into little ravines and coves, plus numerous sea stacks just offshore. Inland, the cliffs are bordered by a grassy plateau, crossed by a few tiny streams, beyond which runs Hwy 1, staying between a quarter and a half mile from the ocean. Further east, the land rises gently to smooth, treeless, undulating hills. 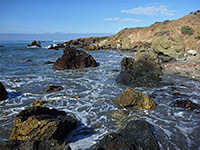 A four mile section of the coast and the thin strip of land west of the highway is protected as Estero Bluffs State Park, undeveloped apart from seven roadside parking areas, but relatively popular owing to the easy access. 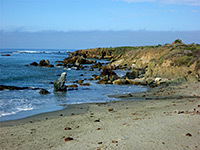 The southeastern boundary of the state park is Ocean Avenue on the northwest side of Cayucos, while the north edge is at Villa Creek, beyond which the ocean is bordered by higher, less accessible cliffs. Varied habitats include freshwater wetlands, dunes (home to the endangered snowy plover), grassland, saltwater marsh and the intertidal zone, while the main visitor activities are walking, fishing and beachcombing. 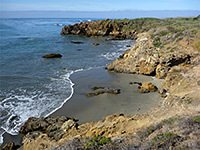 The scenery is not, however, quite as photogenic or interesting as in two nearby state parks, Harmony Headlands to the north and Montaña de Oro to the south, since these have more extensive rock formations, higher inland hills, and a greater sense of isolation. Estero Bluffs State Park is not obviously signposted from Hwy 1, indicated only by small notices at some of the parking areas, all of which are on the southwest side of the road. 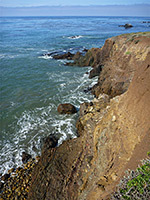 The cliffs along the coast are only about 20 feet high, and the adjacent land is mostly level apart from a few slight hills, so the ocean is in full view from the highway. California poppies and other flowers grow profusely in spring, on the grassy flats and cliff edges. Short paths lead to the ocean from the parking areas, and another runs all along the water's edge, generally right by the ocean, but cutting inland in some places to cross small, steep-sided gullies; the longest hike is about 4 miles, between the furthest two parking areas. It is quite easy to climb down to the many tiny beaches and rocky areas along the way, though some parts of the cliffs are somewhat unstable due to erosion. 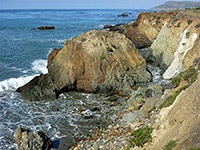 From southeast to northwest, landmarks include San Geronimo Creek, a year-round stream that forms a narrow lagoon just below the highway, rocky Cayucos Point just beyond - the southernmost place in the park, Estero Bay, a broad inlet bordered by a narrow beach, and a much wider beach right at the north edge of the park, leading to Villa Creek, which also flows through a lagoon just inland.